We follow David Ponder as he is taken on a journey to the final summit to help mankind find it's original purpose. There are two words that the group must find in order to set humanity back onto the path that was laid out for it. We follow David to his meeting with powerful men and women of history as they try to find they answer they seek. 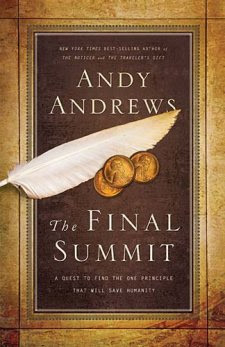 The Final Summit is Andy Andrews follow up to The Traveler's Gift. I have not yet had the joy of reading the first book, but it did not stop me from being able to follow this story. I had mixed feelings about this book. I felt like it was a bit far fetched and at sometimes too silly. No matter what i thought as I read along, I couldn't put it down. I wanted to know what would come of the end of all the dialogue. The historical sketches that were laid out as basis for different answers to the questions were fascinating. Many things I did not know. At the end of it all I was satisfied with humanity's answer and wished to tell it to people myself. I don't want to give it all away. You have to read the book to find out.